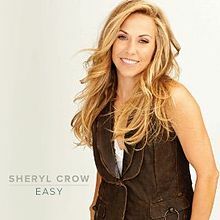 HomeSingle ReviewsSingle Review: Sheryl Crow, "Easy"
Single Review: Sheryl Crow, "Easy"
she’s been making for two decades now, but the lead single from Sheryl Crow’s first full-fledged country album gets several things right. “Easy” is a laid-back summer song that’s meant to go down… well… easy. Its aim is not to offer a deep compelling set of lyrics, but rather it’s mainly about creating the right feeling – channeling the ideal escapist vibe through the right set of hooks and melodies. Crow herself describes “Easy” as “a song about ‘staycation’ — about staying home when you can’t afford to go to the Caribbean or wherever or on your yacht. And making your home feel like you’re getting away.” To that end, the smooth, lazy melody and tasteful production are a perfect fit. Crow’s delivery of the chorus conveys a subtle sense of excitement that quietly pulls the listener in, lending an organic feel to the track as a whole. Unfortunately, Crow’s limited vocal range begins working against her as the song near its end, and her performance becomes shaky and strained as she reaches for notes that seem somewhat beyond her capabilities. It’s not quite enough to sink the record entirely, but it does give a rough, choppy ending to what is mostly smooth sailing up to that point. Single Review: Kristen Kelly, "He Loves to Make Me Cry"
I have always loathed Crow’s voice. Her stylings are strictly nails-on-a-chalkboard. She’s got this nasally, sharp strain to her 3 note range that just makes me tune everything else out, even if the material was otherwise excellent. I’m glad you reviewed this, Ben, or else I’d have no idea if it was good enough for me to give it a chance. Thank goodness, it appears the answer is no since you’re singling out the vocal as an issue. Leeann, I gave this a fair listen but I’m afraid I just didn’t care for the vocals. Thanks for the link, though. Speaking of “Easy”, I didn’t hear any “nasal sound” at all though. Anyway, Rob said the “issues” are near the end of the song. But then again another reviewer on Country Weekly wrote: “Vocally, Sheryl is in her usual fine form and sounds totally comfortable here.” So I think it’s subjective. @Leeann: thanks for the links! According to a recent interview with Sheryl Crow, the other new songs will be more country. P.S. I heard she did the soundtrack for a country movie? Does anyone of you know the title? thanks! I like the sound of Sheryl Crow’s voice too. I generally don’t consider her a great vocalist, but I do think she can be an effective one. I may even have a bit of a soft spot for her since my parents are big fans of hers, and her albums being played in our home became a significant part of my childhood soundtrack. I enjoyed “Easy,” but like Leeann, I do hope that the rest of the album is more country, which I expect it will be. I just saw her singing at 95 KSJ in Mobile! She was very nice! Sheryl definitely falls more in the category of “effective” singer as opposed to “technically great” singer. Not that that is a bad thing at all. Her vocals on songs like “Weather Channel” and “I Still Believe” hit my heart. Sheryl has always had a “roots rock” influence, and with acts like Mumford & Sons, Avett Brothers, etc. having success now, it seems more like Sheryl just riding a wave she was already on. …it ain’t exactly grippin’, is it? the fact that such a mediocre singer could have the career she has, is as astonishing to me, as the fact that jeans with holes and dirty worn out patches on them could become a seriously expensive must-have fashion item or blake shelton a “superstar” with hardly one good album to his name – leaving aside “greatest hits”. Sheryl Crow was one of the greatest pop singers of the 90s. She may not be the greatest technical singer, but there is a raw emotion to her voice. I have loved “Soak Up the Sun”, “If It Makes You Happy”, and her version of “First Cut is the Deepest” for a long time. In “First Cut is the Deepest”, her voice drips with such emotion that I get fully immersed in it. In short, there is nothing “mediocre” about Sheryl Crow. She deserves the career that she has. Sheryl Crow has always struck me as a rock/pop singer with more country “chops” than most actual country singers (see also Jack White, Tom Petty and Mike Ness as other examples), so I’m looking forward to giving the new album a try. Her contributions on country tribute albums have always been highlights, particularly with the Hank Williams “Timeless” album from a few years back.